The 12-week Job Search Academy offers an innovative learning model that provides you with a unique opportunity to receive coaching and training tailored to your particular needs and interests. Our Job Search Strategist Program is a new sophisticated and systematic program that goes DEEP into the best job search practices. At the conclusion of the program, participants who have missed no more than 2 classes may sit for the CJSS Online Learning Review, which involves a short multiple-choice exam, completion of 6 hours of audio learning and a Case Study. A case study involves co-creating a job-search action plan with the job seeker, providing appropriate resources for the job seeker (from class materials), and coaching the client in getting interviews and job offers. There is no additional fee for the exam. 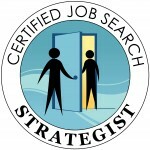 Those passing will receive a listing on the Job Search Academy web site to promote your credentials as a Certified Job Search Strategist, rights to use the CJSS logo and a certificate. To maintain the CJSS credential, every two years you will need to attend an annual update training. Certification requires two years of experience in the careers field. We “meet” from the comfort of home/office via telephone bridge line for 12 weeks, for 2 hours each week. Total class hours are 24. The beauty of the 12-week program allows you the time and framework to assimilate, practice and execute the new systems, strategies, and communication styles learned – in fact, we highly recommend that you work with a client or two while participating in the program.